The result of extensive collaboration with trail running and mountain biking pros, the Ultra is the ally of those who can push themselves to extreme limits. Thanks to the perfect hold, lightness and venting system of these glasses, you’ll feel that they’ve become a part of you. Featuring the new Zebra Light lens, liberating your field of vision and providing maximum cover from morning to night. The Ultras are BIG! By that I mean they are truly large on the wearer’s face regardless of how big one’s head is. Typically, I wear a small/ medium size sunglasses and the Julbo simply dwarfed my tiny bean. Oddly enough, the glasses fit quite well and were very comfortable. The large size and design seem intentional, providing a great deal of coverage and scope of vision and not allowing any unfiltered light in around the lenses. The construction of the Ultra is impeccable with a very sturdy yet flexible frame, larger screws than what is typically used in sunglasses, and a sturdy rubberized nose piece that looks as if it will hold up over the long haul. The lenses are photochromatic and range from nearly clear in low light to nearly opaque in bright sunlight. Julbo rates their lenses in four steps, from lightest to darkest. The Julbo Ultra’s Zebra lens changes from a 1 to a 3 in its dawn to dusk range, and provides a great range of light that these sunglasses are able to function in. My first foray wearing the ultra took place on a rocky and moderately technical trail run with a high level of exposure on a very bright day with some cloud cover which changed the light conditions often during the run. I never noticed the Zebra lens transitioning from lighter to darker with the changing light conditions as the lenses afforded me an ideal level of light to judge technical running terrain. The Ultras fit securely and did not move at all during use, and the anti-fog coating on the lenses worked quite well. The full coverage of the Ultras kept my eyes from drying out in the wind and I was never seeing around the lenses which can cause a runner depth perception issues. The side temples of the Ultra are fairly wide, and the arms of the glasses have a strip of anti-slip rubber down their length. After most runs the lenses of the Julbos were smudged and sweat streaked at times, and they cleaned up very easily with the a soft sunglasses bag and some water. These lenses, while extremely flexible, also seem like they’d be durable enough to handle a face plant on the trail and the extra lens coverage never hurts for those accidents either. On my first trail run with friends wearing these sunglasses other runners eagerly passed them around and commented on how light they were and the enormous field of vision afforded by the Ultras. 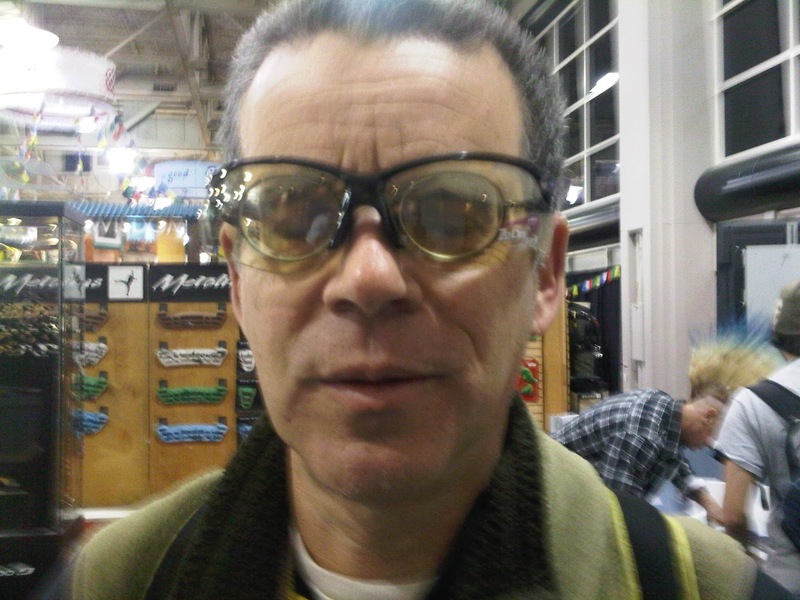 One friend was even able to fit them over his prescription eyeglasses, which is a feature some people may like. Another commented on how secure the fit felt to his larger than average head and face stating that he struggles to find sunglasses that fit him adequately. Even with my smaller head and narrow face, the Ultras did fit very securely and the photochromatic lenses transitioned seamlessly through varying light conditions. The glasses are sold with a soft shell case with an MSRP of $180. Disclosure: As noted above, Julbo provide the test pair of Ultras. Yes, Julbo has advertised on iRunFar. No, we don’t think that’s a big deal, as we only run ads from companies we believe in. From the first sentence about "BIG", what I really wanted to see was a photo on someone's face c/w other glasses. Big as in "everyone on the trail turned to see my big glasses" or "I fit in well at the clown show afterwards" or "big, but after wearing them a little no one noticed anymore." Tough to order a pair of these, I think, given that comment without further doing some more research. Feel the same way. These sound awesome, but the size gives me pause. Photos would help. Is this model available for sale anywhere? I love the $12 glasses I bought at the local hardware store. They're light, fit well, and work great. If I paid $180 for glasses I'd quickly lose them, I suspect. The photo above is of me at Outdoor Retailer. They do fit well over prescription specs. No slip at all. I haven't tried a pair in wild yet but given my experience with the Trails I think that the even clearer 1 level will be very useful when running into shady areas or at end of day. Here is my post from OR. You can get them from the Julbousa website: [broken link removed] . (in best Cliff Claven voice) It's a little known fact that these glasses were inspired by U2's Bono during his period as "the fly" on the Zoo TV tour in the early 90's.